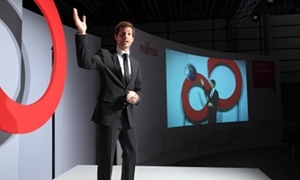 This year, I once again had the privilige of being the moderator for the “Fujitsu Future Forum 2010“. 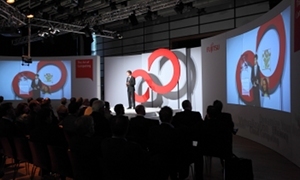 From August 06 – October 05, 2010, the Fujitsu roadshow traveled the cities of Berlin, Hamburg, Düsseldorf, Mainz and Ludwigsburg to present the latest IT trends and technologies under the name “The Art of Computing“. Using an innovative and interactive new format, developed by Head of Event, I was recorded on stage by a camera and then digitally inserted into a virtual world with interactive elements, which I was able to move around to support my moderation. A real challenge for me on stage and a fascinating experience for the people in the audience.